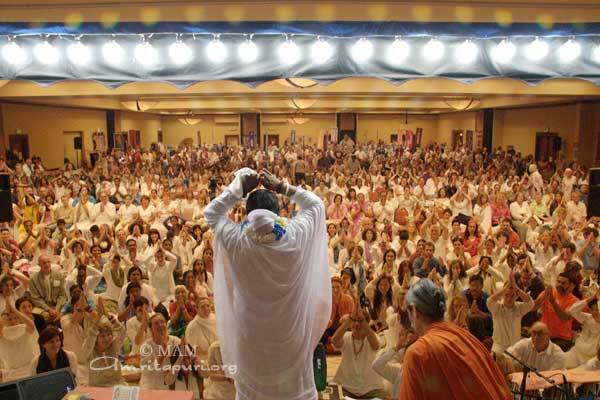 During the 5 day visit to Dearborn, Michigan, Amma conducted two days of public programs as well as a 3 day retreat. 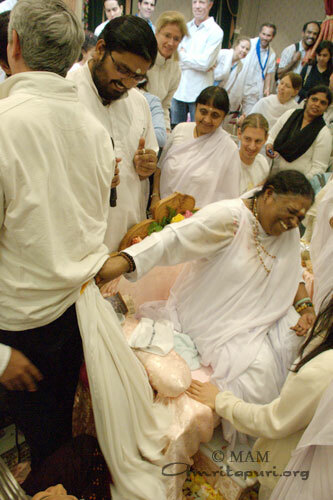 After departing Europe, Amma flew over 5000 miles across the Atlantic Ocean to Her ashram situated in the rolling hills of San Ramon, California for a week long program. 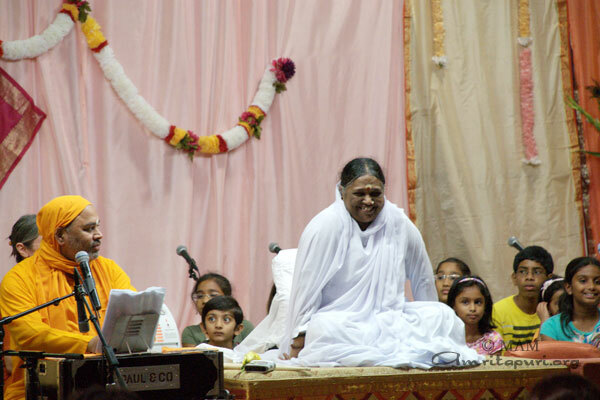 Thousands of devotees braved the rain showers and the cold weather to come and receive Amma’s blessings. 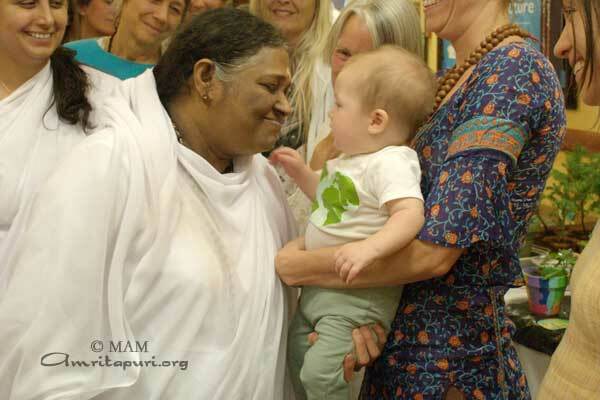 Hollywood actor Kurt Russell made his way to Amma’s ashram. 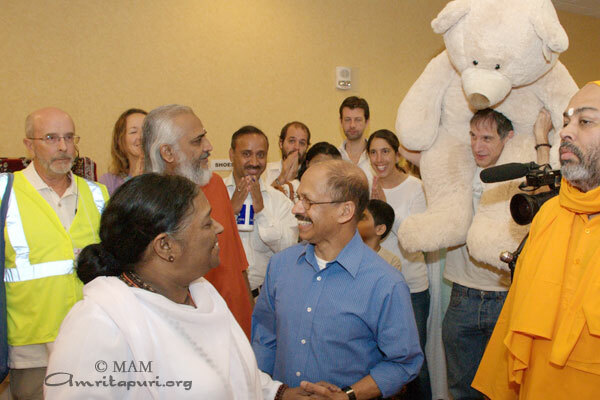 He too, was eager to find out what was drawing such large crowds on one of the biggest American holidays, Thanksgiving. 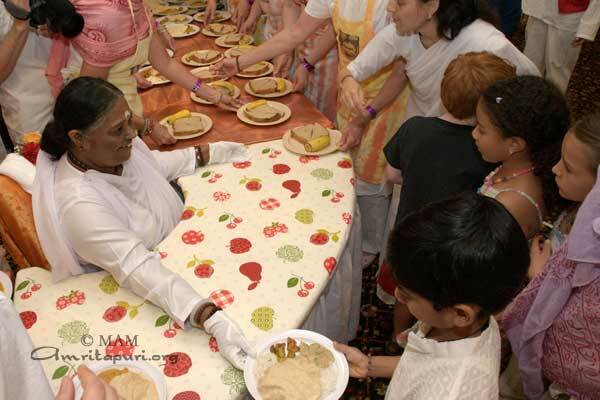 Amma served a Thanksgiving dinner to all her children present on Thursday night, leaving the devotees filled with happiness and gratitude. 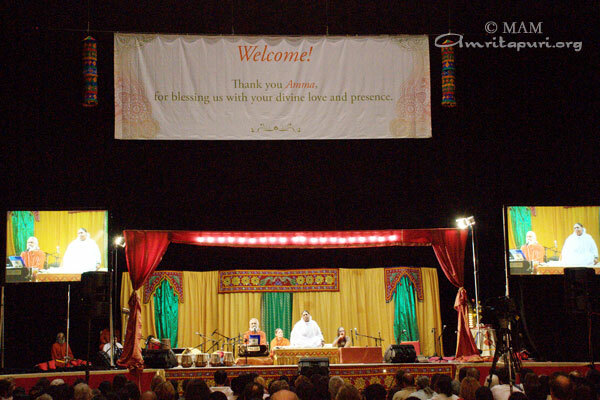 Here are the dates of Amma’s Nov – Dec tour of USA. 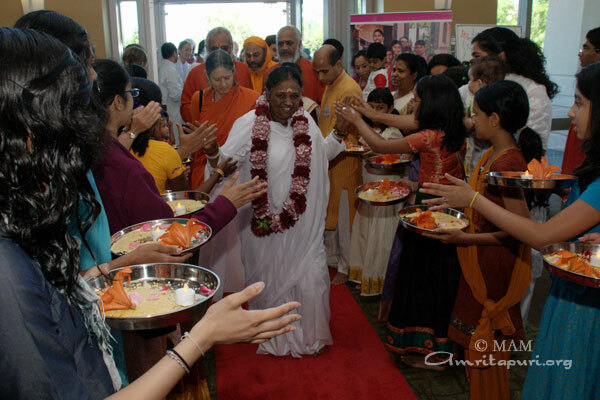 After a 9 hour drive to the border, Amma crossed over into Canada, arriving in the city of Toronto where She commenced 4 days of programs at the Double Tree Hotel and Convention Center near the international airport. 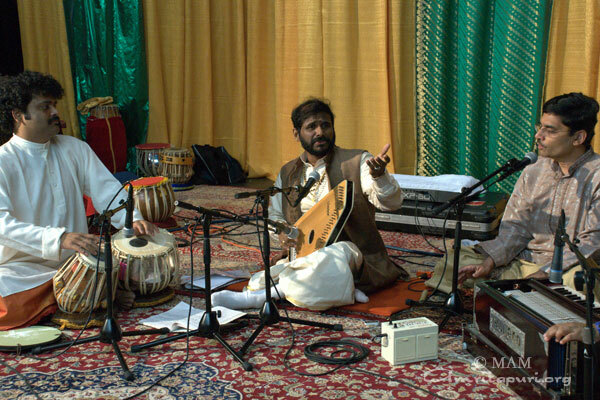 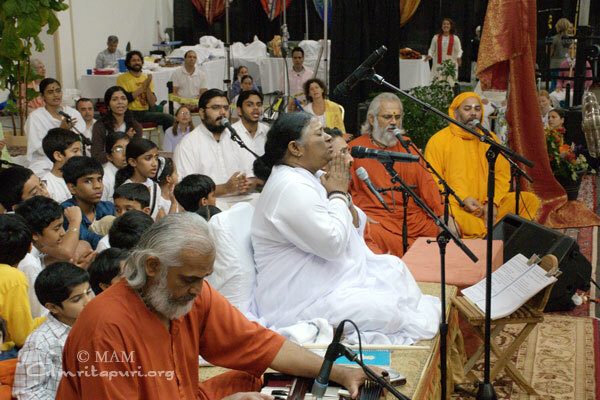 Local satsang groups performed a variety of cultural performances whilst Amma gave darshan in the hall which was filled beyond capacity, with many devotees having to view the evening program from an overflow room by video link. 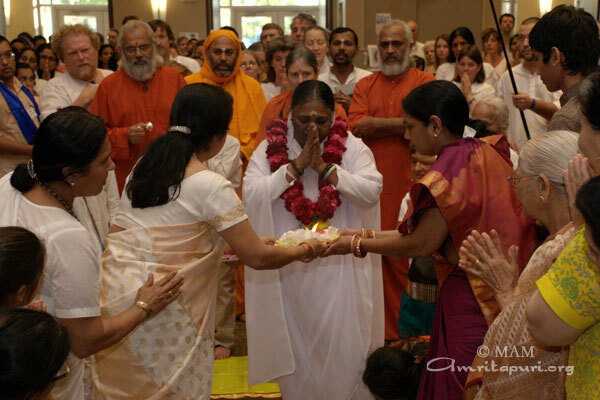 This concludes Amma’s 25th year of touring North America. 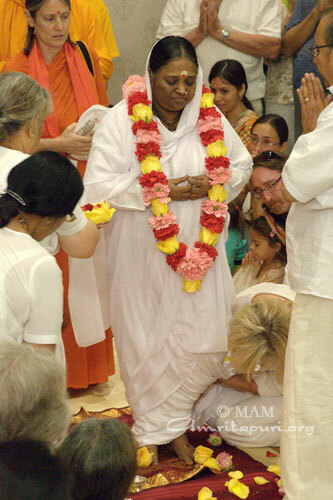 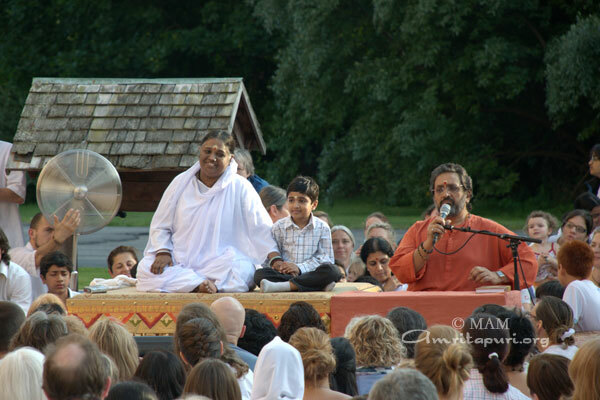 Amma arrived in Boxborough, Massachusetts where she held a days public program followed by a 3 day retreat at the Royal Plaza Hotel and Convention Centre in Marlborough. 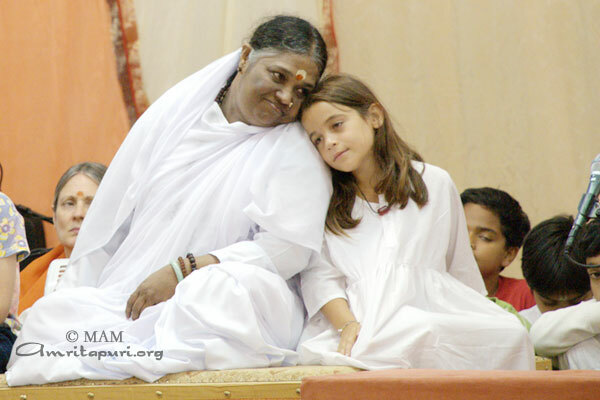 In the retreat Amma told her children that “if there is dispassion in your heart, you can certainly outlive the situations”. 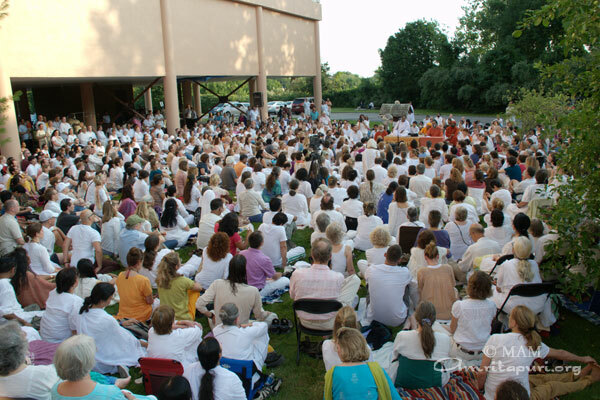 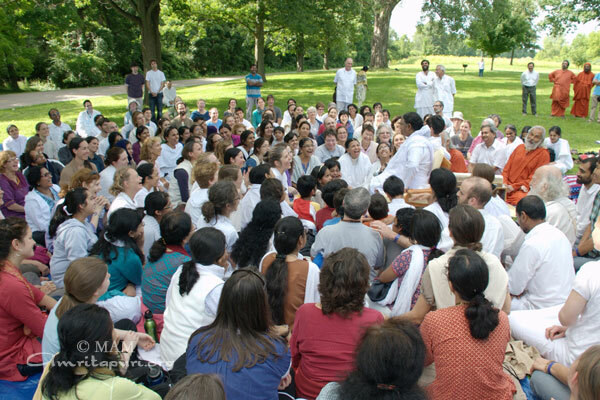 Amma lead those who had gathered to see Her in a guided outdoor meditation, surrounded by the lush greenery of the forest that dominates the area. 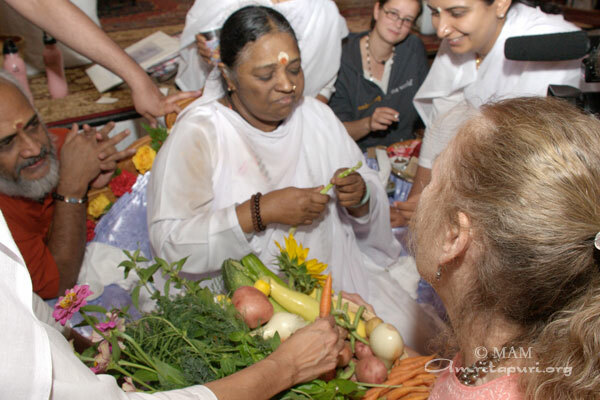 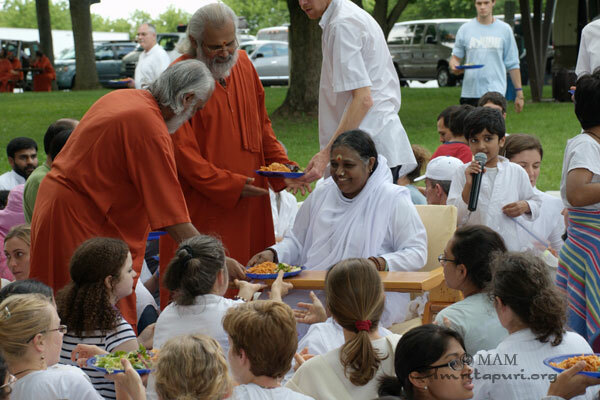 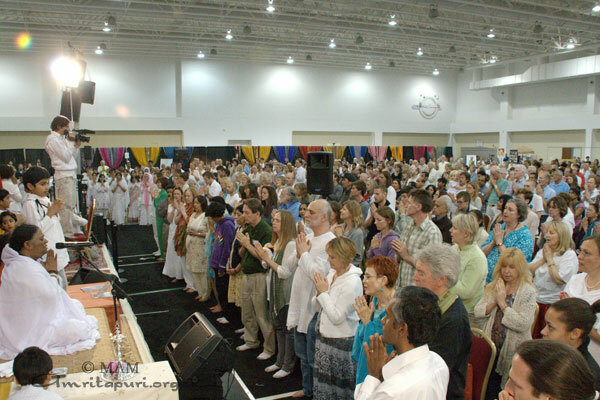 She then served food to all those who came and sung Bhajans as the day drew to a close on the last retreat in the United States before she concludes her 2011 North America Yatra in Toronto, Canada in a few days time. 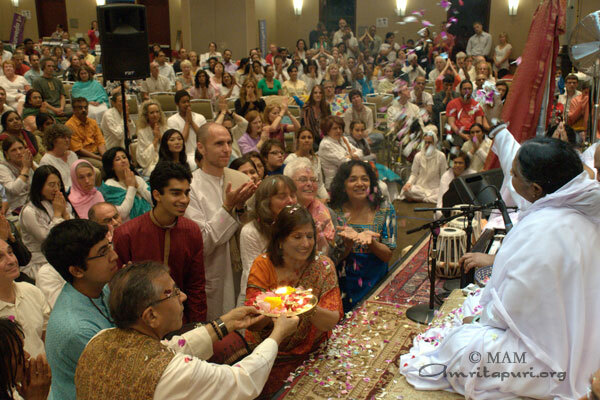 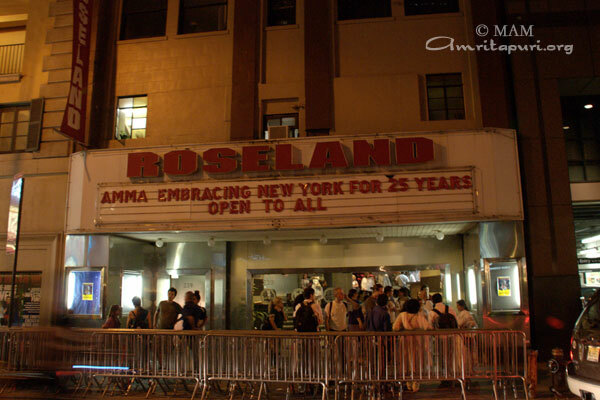 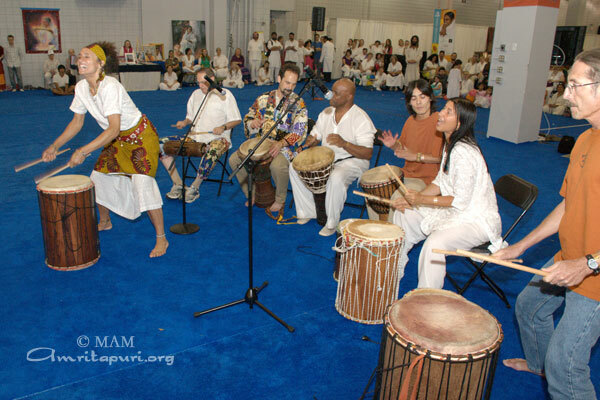 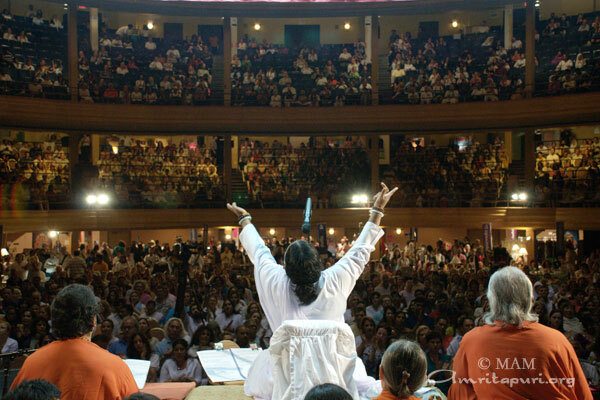 Amma arrived in the heart of New York city, also known as the Big Apple, where she held a one day program at the Roseland Ballroom followed by 2 days of programs at the Manhattan Center with the final day falling on the 4th of July, American Independence Day. 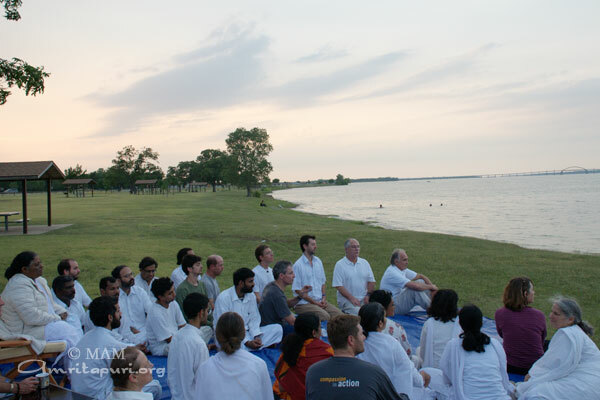 The public holiday was celebrated with much of the city gathering to watch the dramatic fireworks display over the water surrounding the island of Manhattan, the city that never sleeps. 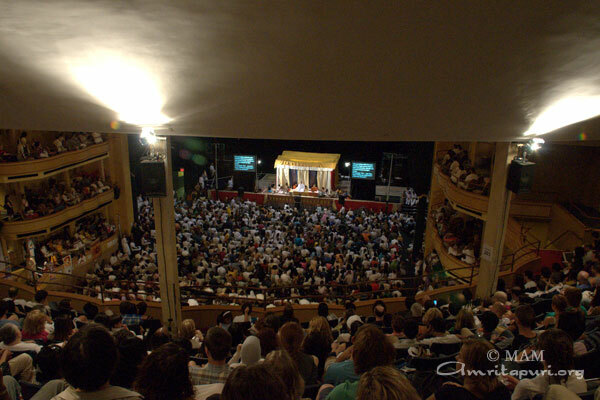 Thousands came to receive Amma’s darshan, with many queuing for hours on the bustling sidewalks of 34th street. 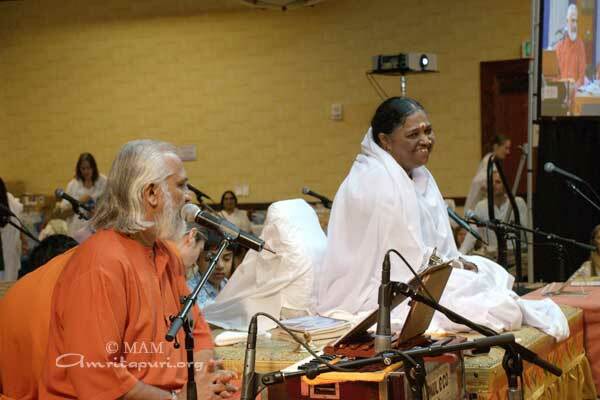 Renowned singer Ramesh Narayan, disciple of the world famous Hindustani musician Pandit Jasraj came to receive Amma’s blessings and sang a number of soul stirring bhajans during darshan. 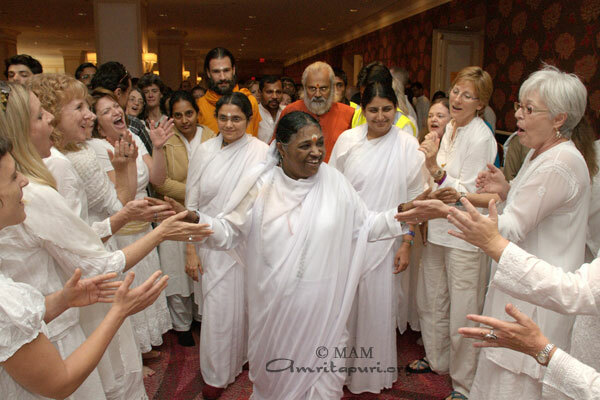 Amma arrived in the city of Chicago to commence 2 days of public programs at the Westin Hotel and Convention Center. 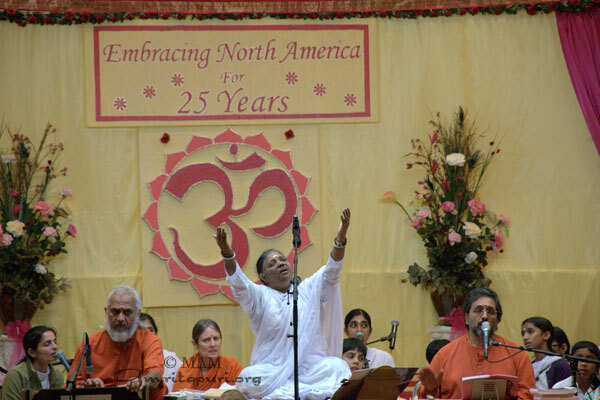 Devotees came from far and wide to receive Her darshan and to celebrate the 25th year since her first tour of North America in the summer of 1987. 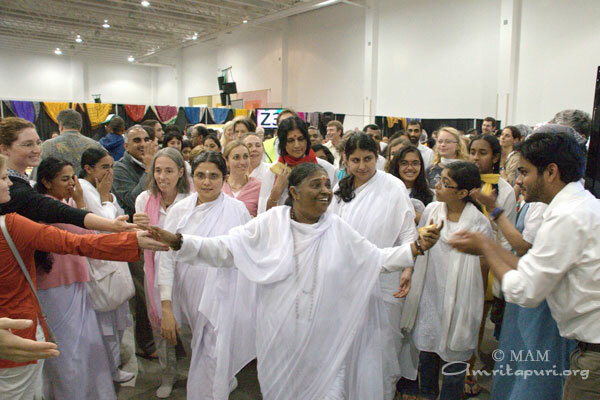 The halls of the convention center were overflowing with devotees, many of whom had been waiting for over an year to see Amma again, many others who came to meet Her for the first time. 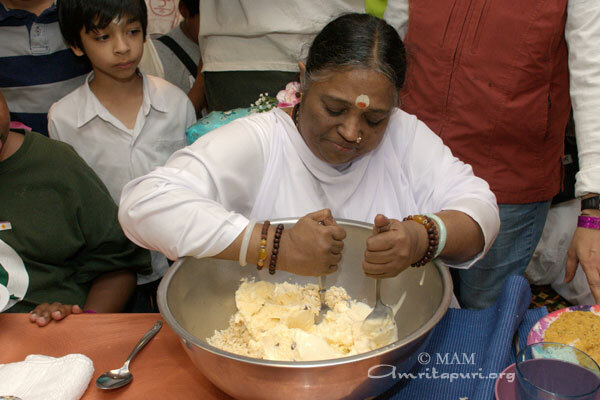 Just as food and sleep are essential for the body, a healthy diet of positive thought is necessary for the mind. 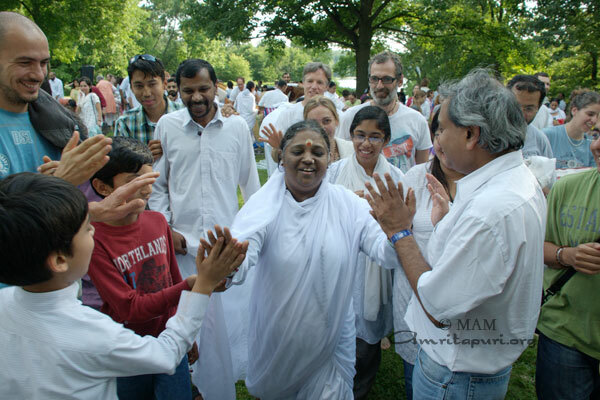 If the brain commands the feet to stop when walking, the feet will stop; if it asks the hands to stop clapping, the hands stop. 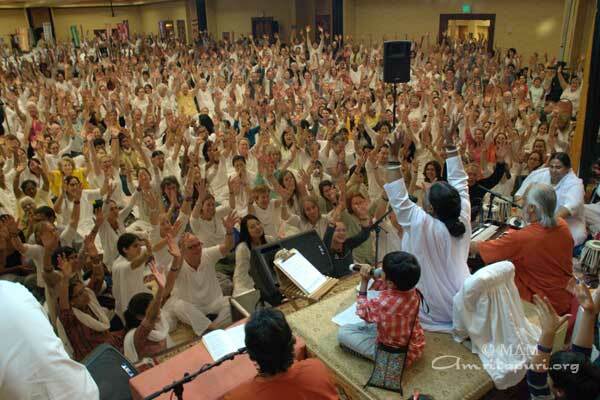 Similarly if we ask the mind to stop, will it stop? 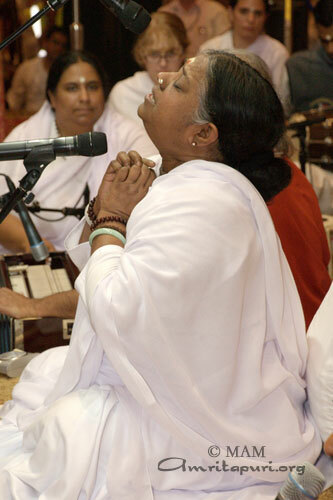 We should be able to stop the flow of thoughts in the mind- this is meditation. 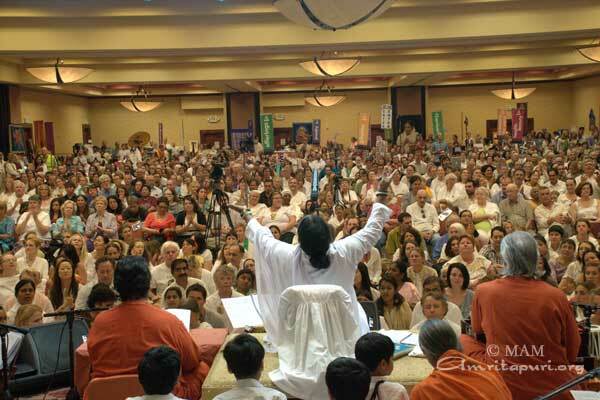 We do not try to still the mind. 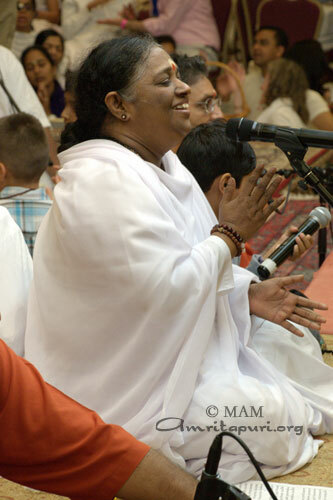 Everything is revealed in a still mind. 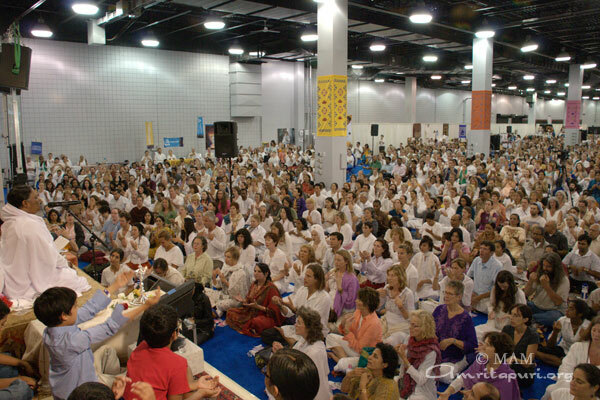 To paint a picture that inspires the observer, to write a touching poem, to help a student concentrate on his studies for an exam, to help a scientist ponder the mysteries of the universe, this concentration is necessary. 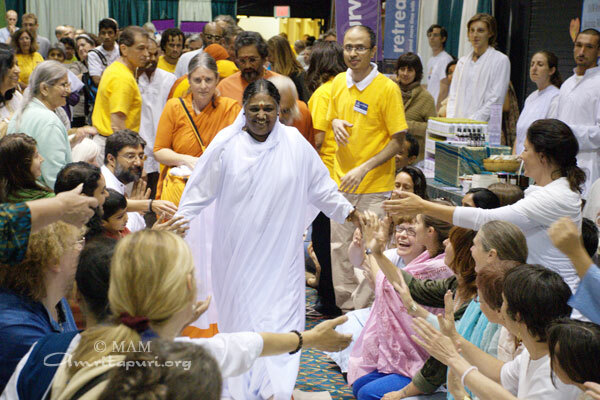 Amma arrived in Coralville, located in the heart of the mid-west state of Iowa to commence 2 days of public programs at the Marriott Convention Center where thousands gathered from across the country to receive Her blessing and guidance. 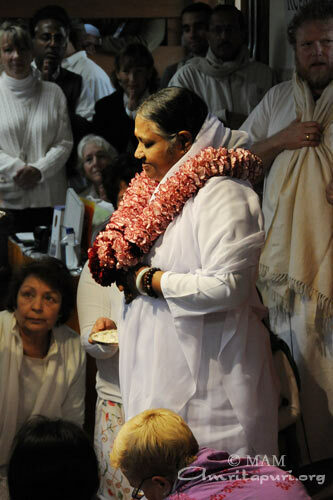 Those who came for Amma’s darshan were comforted and moved to tears. 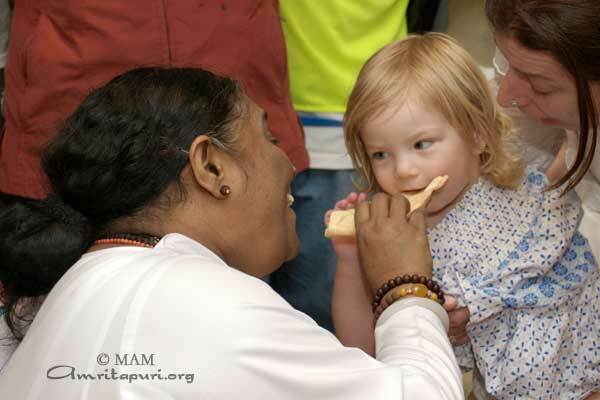 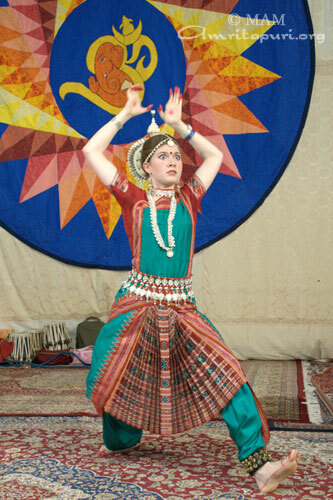 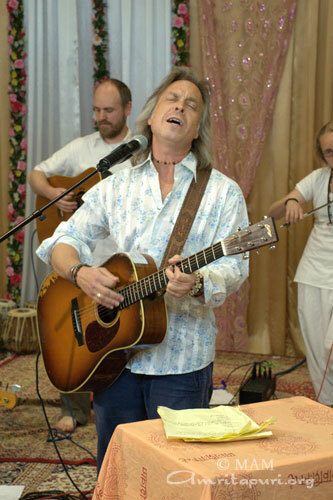 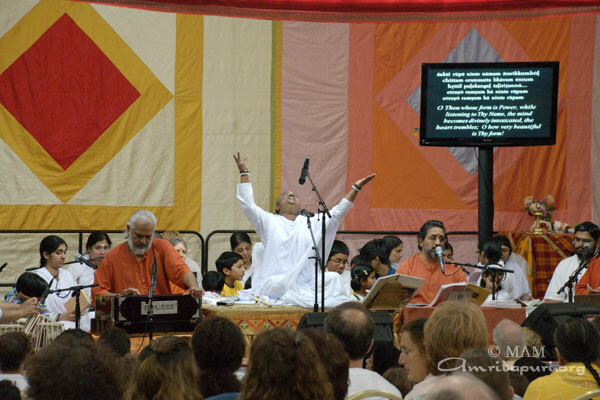 One devotee said: It’s quite remarkable to see what Her program has done, it was quite simple and joyous to be here. 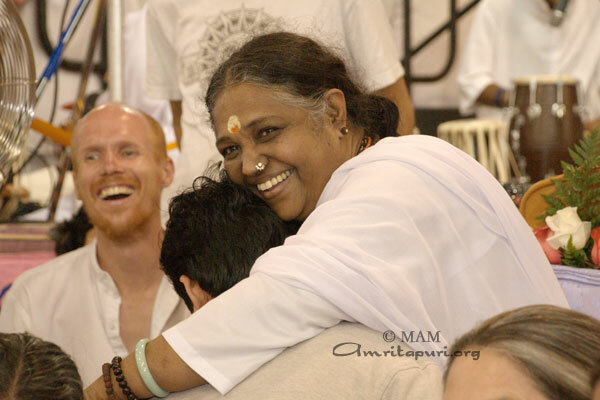 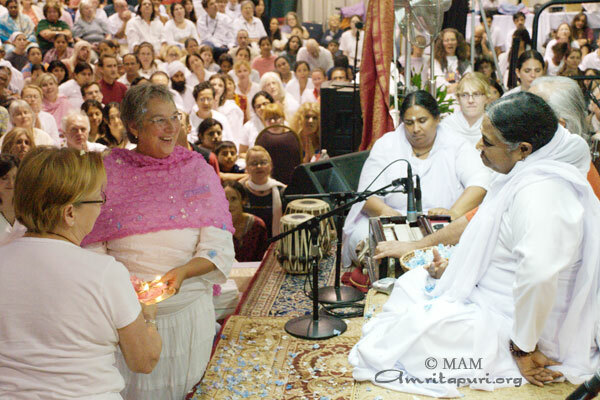 Another local devotee said: When you’re out there in the world working, and you’re looking around and seeing how things are so difficult for so many people, and how things are falling apart, and you search for right action and right behavior, the answer will come from Amma. 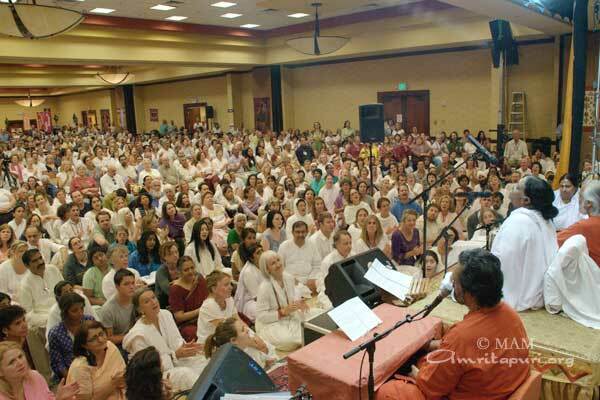 If you come here you will get the answer. 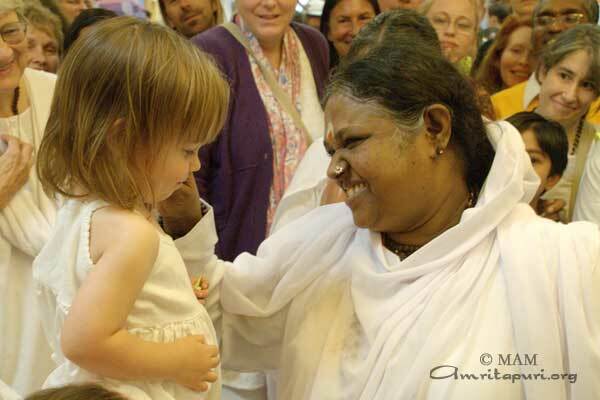 Amma: If we touch fire once, it burns us and it teaches us not to touch fire again. 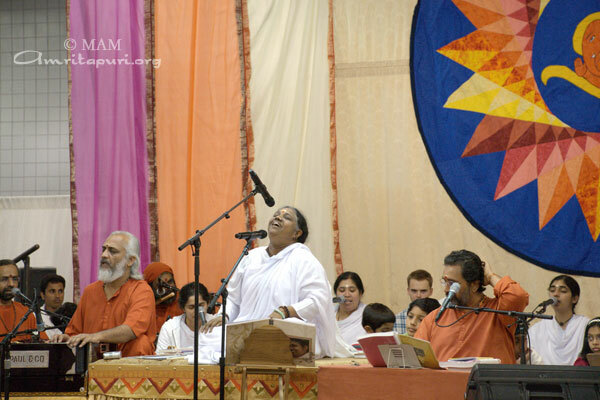 But even though we know that evil actions will give bad results, this lesson does not sink in and we continue to do wrong actions. 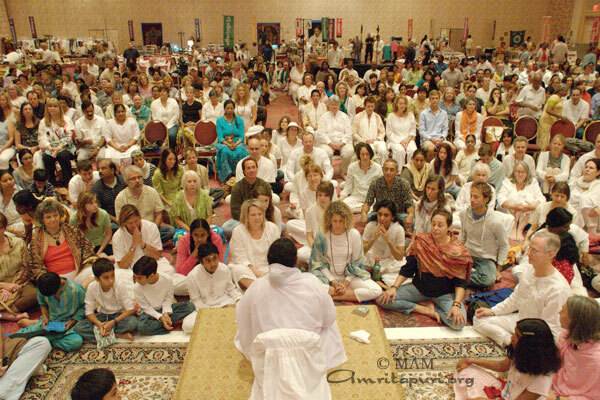 The reason why it does not sink into our brain is because of the time lag between the action and its result. 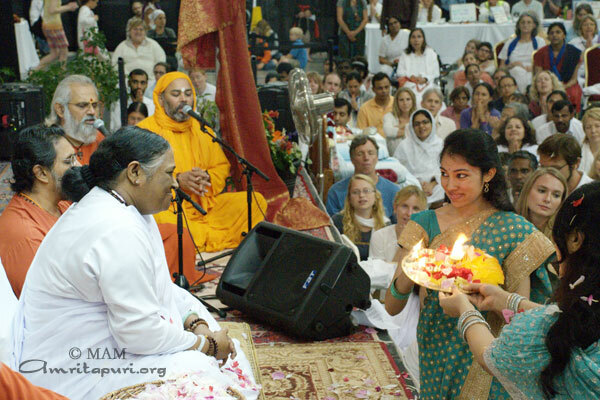 There is no time lag between touching fire and burning- so it is easy to connect the action to the result. 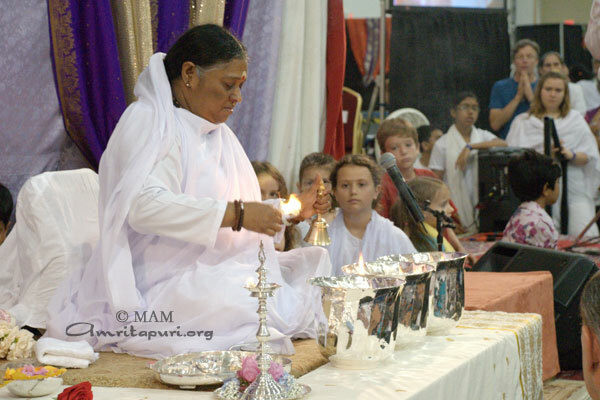 But the course of karma is beyond the mind’s understanding. 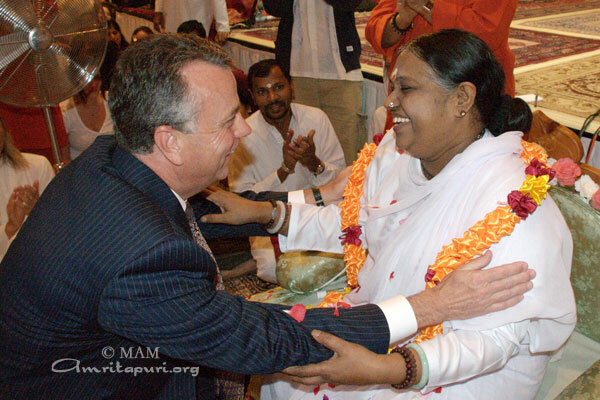 This is why the awareness of righteousness that the principle of karma teaches does not sink into our brains. 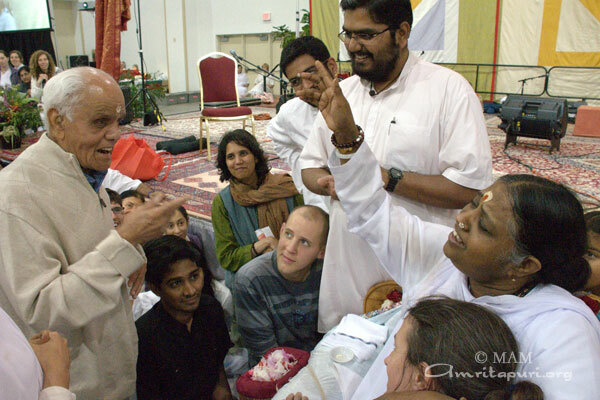 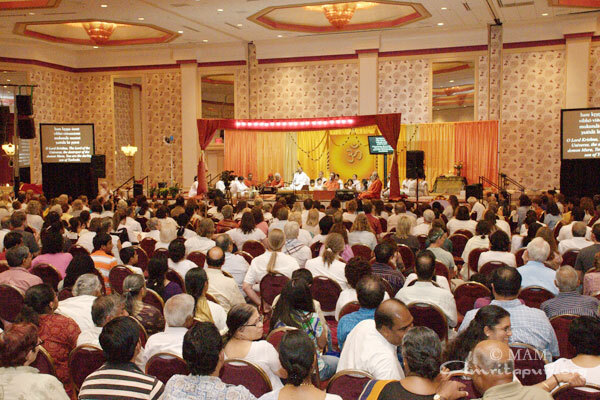 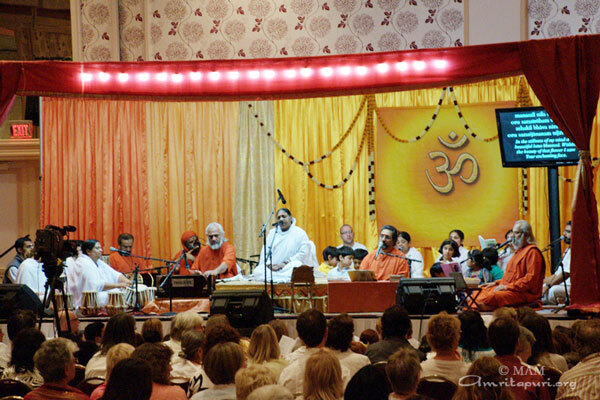 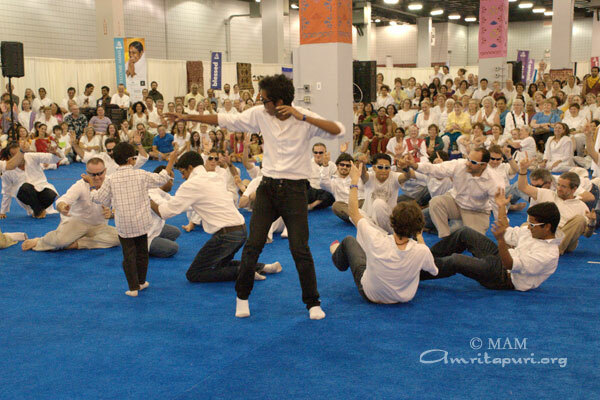 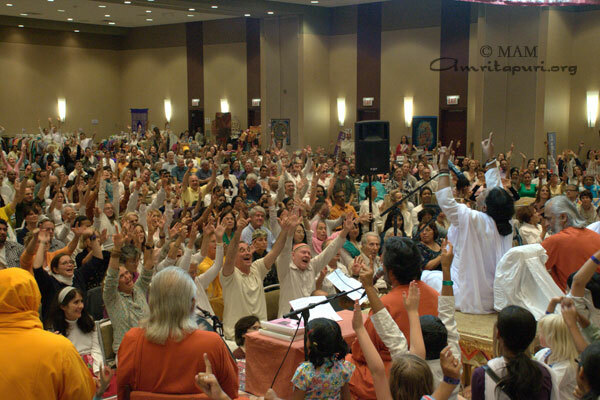 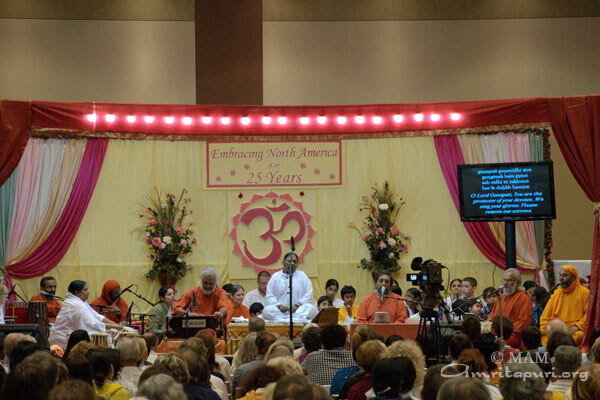 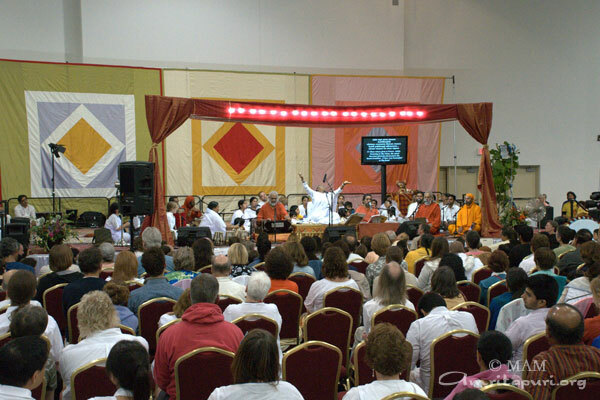 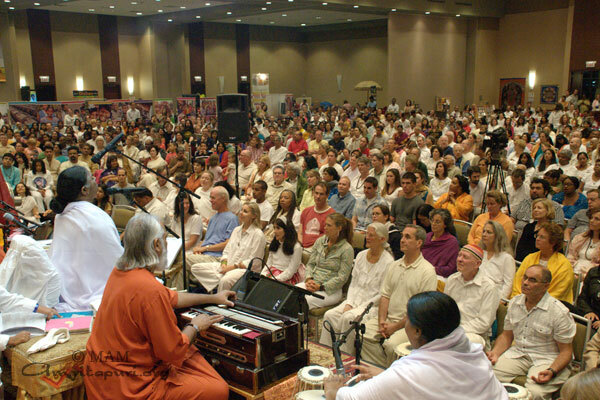 Amma held two days programs Addison, Texas at the Intercontinental Hotel and Convention Center. 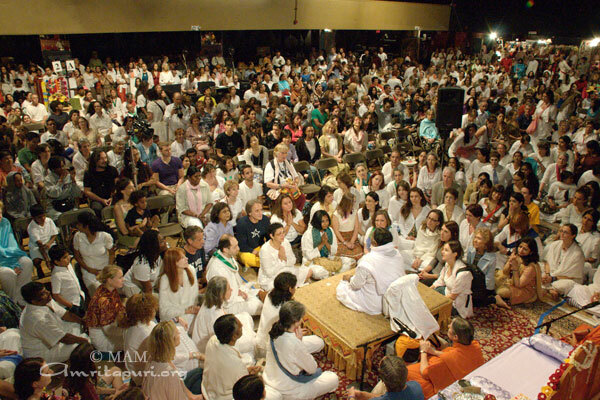 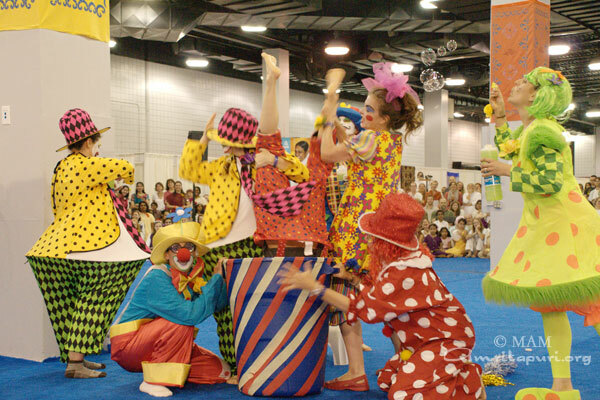 The local affiliate of the NBC TV Channel came to interview Amma about Her message to the world. 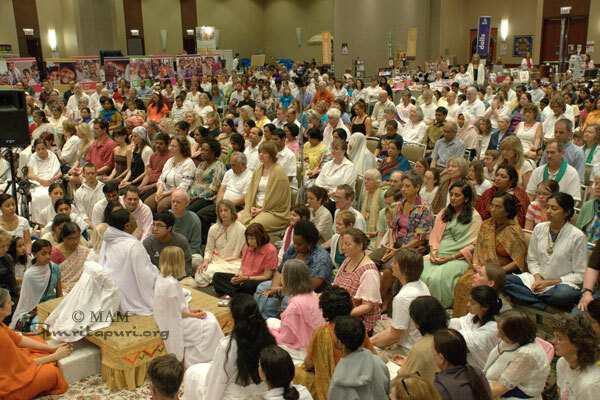 Amma conducted the Atma Puja for world peace and harmony, devotees came together from across the south-western States and from around the world to participate in the ceremony. 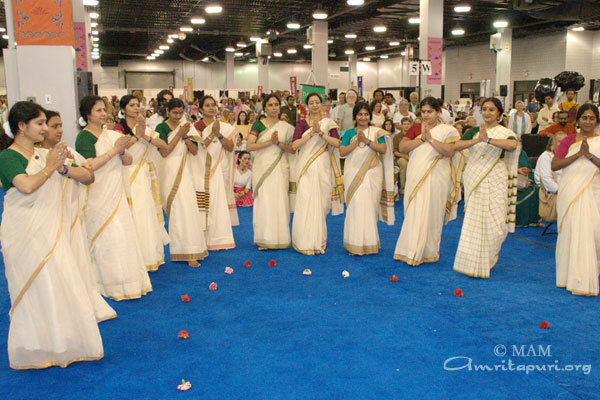 Former acclaimed actress Divya Uni’s students performed a stunning dance for Amma during the Darshan. 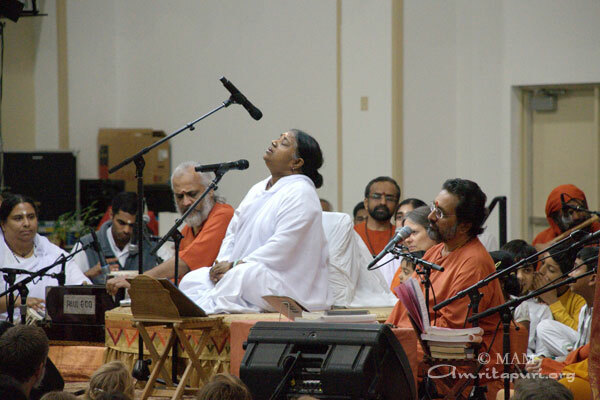 After concluding her LA programs, Amma inaugurated a the MA Centre in Redondo Beach in the South Bay region of greater Los Angeles. 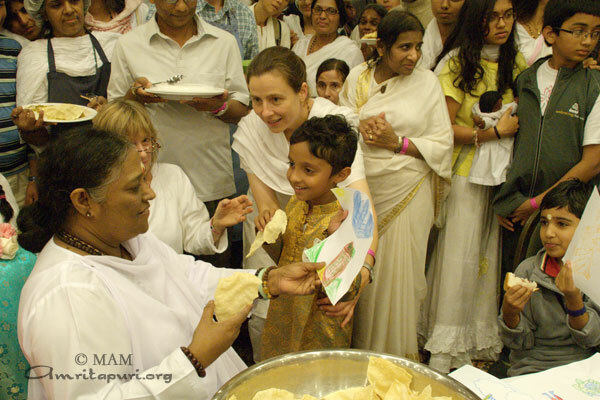 After satsang and bhajans Amma distributed Prasad to the devotees who had gathered for the event. 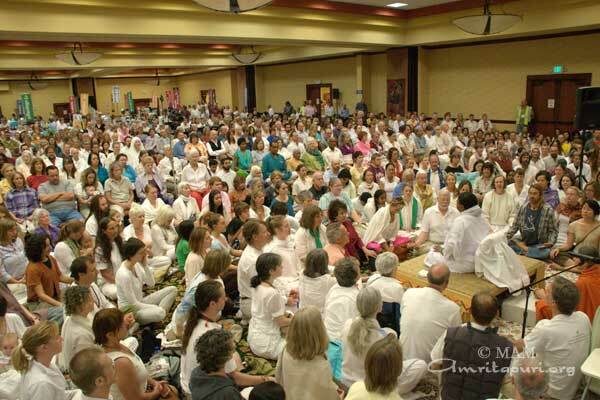 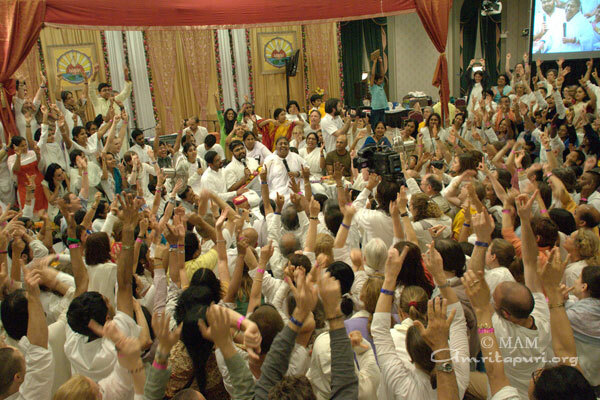 Amma then travelled 15 hours across the desert to the state of New Mexico where she held a a 3 day retreat and a one day public program attended by thousands in the city of Albuquerque. 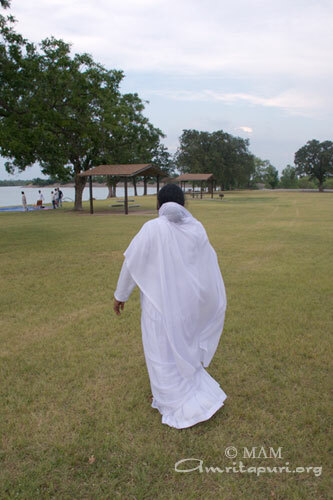 “Worldly life is like going mountain-climbing. 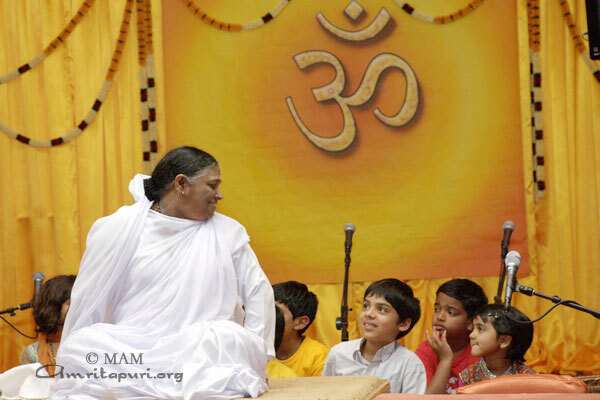 When we climb up a mountain, we tie a rope at the top of the mountain and one end around our waist and we climb up holding onto the rope so that we do not slip and fall. 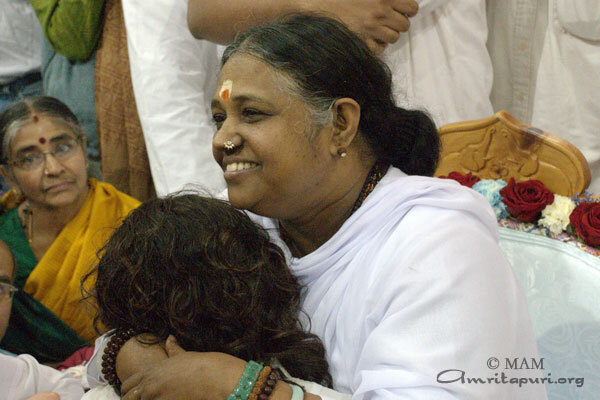 In the same way, if we tie the rope of love for God around our waist, problems in the external world will not make us weak. 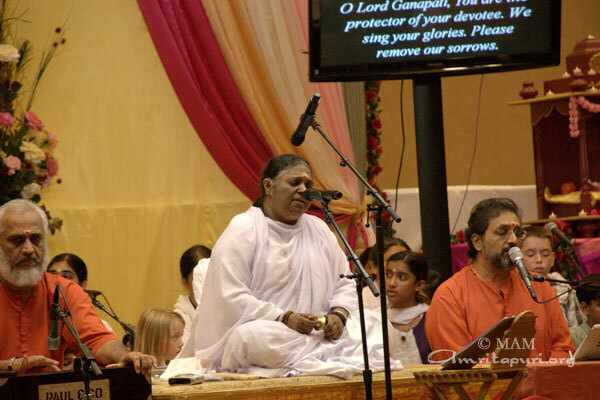 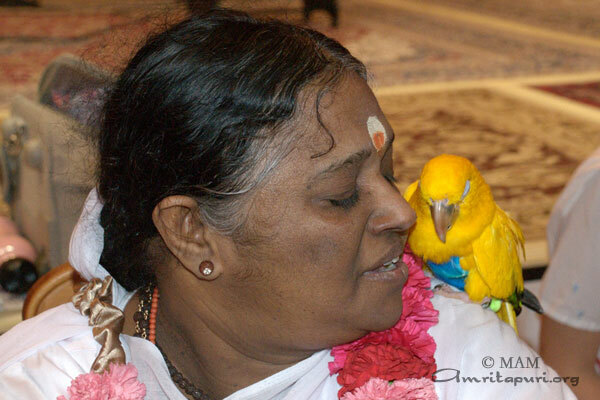 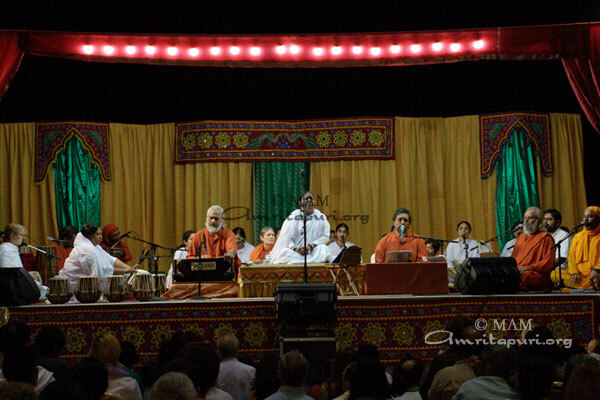 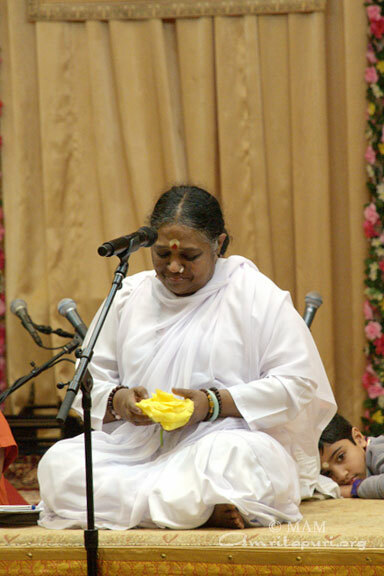 Understanding this, we should hold on to the Paramatman, the Supreme, and move ahead” said Amma in her satsang. 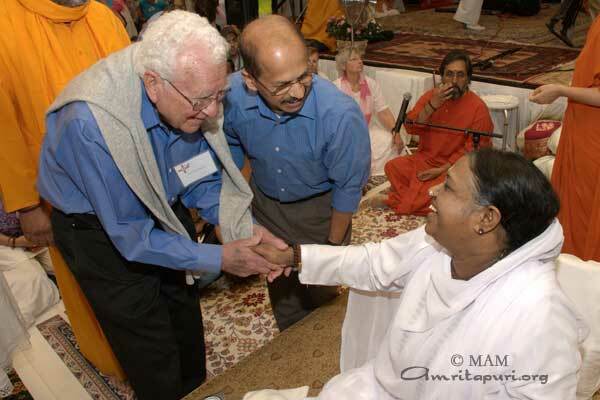 Famous American physicist and Nobel Prize winner Murray Gell-Mann came to receive Amma’s darshan.